UC Browser is one of the most popular third party mobile browser that gives you a fast all-in-one web experience across all platforms from Windows Phone to Android. UC browser has huge base in China and this browser has reached 500 million global users in March 2014 according to UC Web report. Alike Opera browser, UC browser also uses cloud acceleration technology which makes browsing web pages much faster using data compression technology to reduce the data consumption by up to 70 percent. 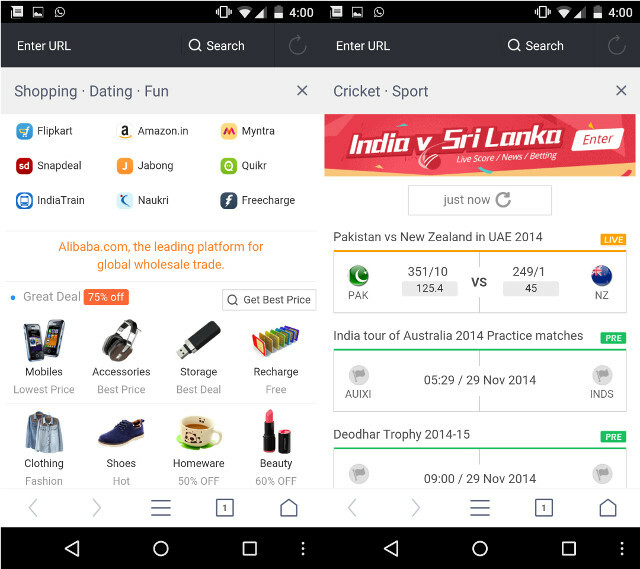 UC Browser recently upgraded to v10.0.1.512 which gives a complete new user interface to the app. The navigation page has been redesigned and more importantly for Nexus users – UC browser is now fully compatible with Android 5.0 and x86 devices. In addition to these changes UC browser has been designed to make it fit for one-handed use by moving the menu button at bottom to improve reach-ability. We have been using UC browser as our secondary to go mobile browser from couple of months and we have found its usage very useful especially when on mobile data. The unique accessibility features makes the browser different from others and this is reason why it should be tried at least once. This is the home page of UC browser and it has bookmarks for most commonly viewed websites and the navigation page can be completely redesigned as per user requirements. 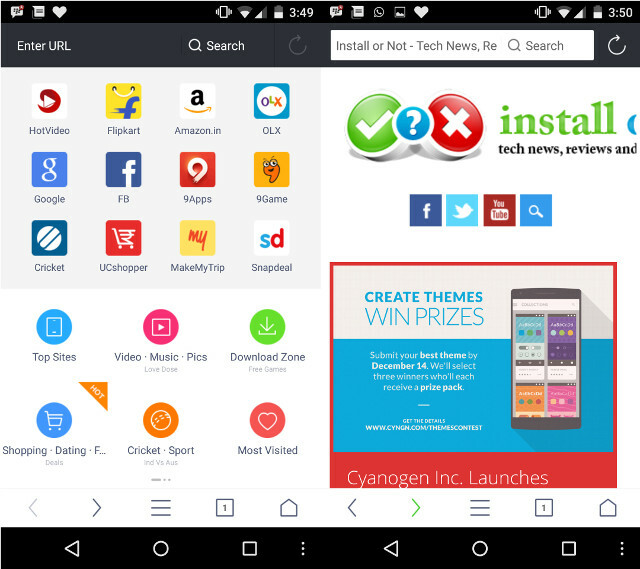 The unique feature about UC browser is that it can be themed, the themes can be downloaded from the theme store for free. 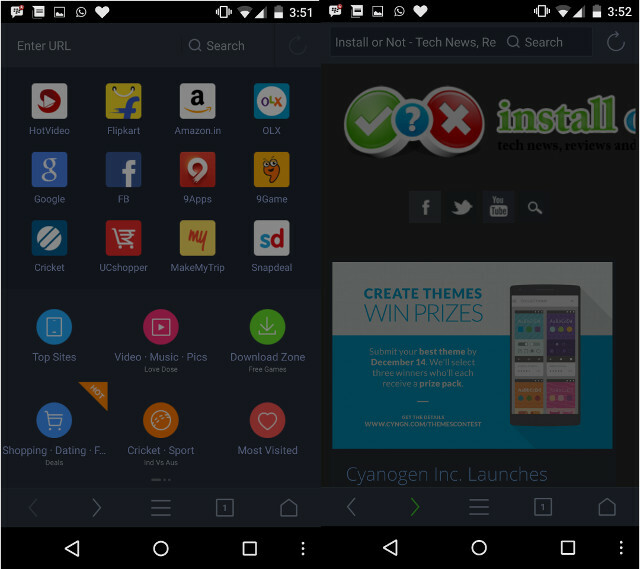 Themes completely redesign the browser and all these can are free to download. UC browser features custom developed social networking inbuilt applications that allow faster social networking. 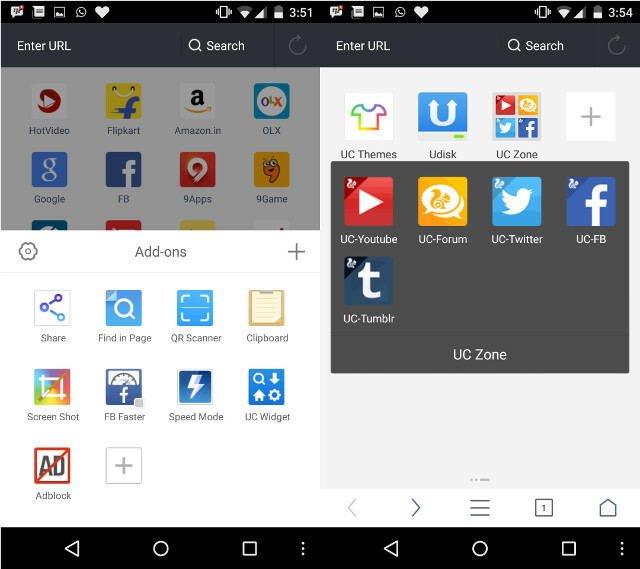 Some of the Applications from UC Zone are YouTube, Facebook and Twitter. 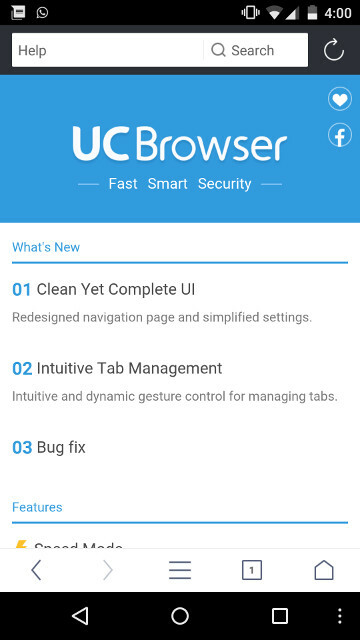 UC browser keep on adding features to their Add-ons , these Add-ons that make this browser different from other browsers available in App Stores. You can share any page with your friends, scan a barcode, copy text from webpage to clipboard, browse internet in incognito secure mode and most importantly- block advertisements on webpage. Night mode feature allows users to browse internet in dark areas by reducing the brightness of the screen and by inverting the lighter & brighter colors on the webpage. Night mode make reading more comfortable at night. UC browse has bookmarks for live cricket score update on the navigation page. The Cricket section on navigation page gives users live score for all ongoing cricket matches as well as results of all previous matches. The shopping bookmark on navigation page contains hyperlinks for all online shopping websites that are most common and in addition to this it lists all the great deals that are ongoing and displays the best discouts that are currently available. 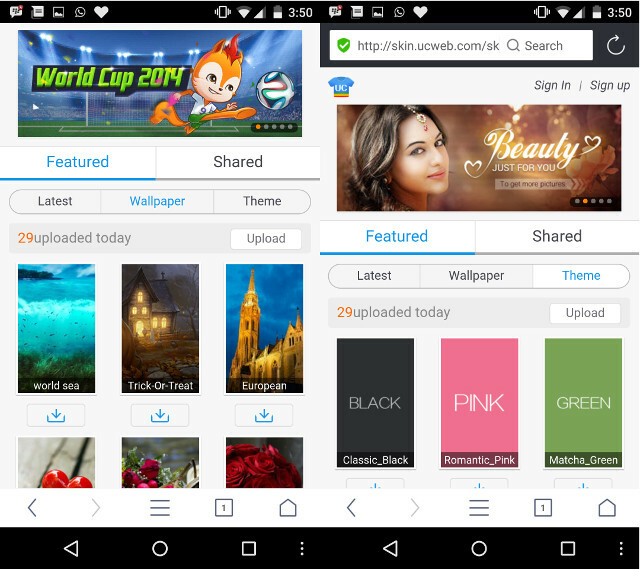 UC browser features smart download manager, users can download multiple files at the same time and files can also be downloaded in background. The app when counted for low-end devices also work very well. The resource overhead for this application is much less than for say, Chrome for Android. This affects overall performance of the app considering long term usage which is usually degraded on other apps as the cache size is increased. We cannot say it can totally replace our primary browser which for most of us is Chrome for Android because of its amazing features like sync with desktop browser which is lacking on UC Browser. We aren’t that fond of the UC Zone or the themes, but night mode is a nifty add-on. The featured category including that of cricket, shopping etc. are included for accessibility but we are not sure how many people will actually use it. The best thing about UC browser is how fast it loads the webpage even on EDGE data connectivity compared to others. The closest competitor to UC browser is Opera which are always neck to neck when analyzing benchmark scores. Overall, good especially after the UI enhancements and an actual worthy update from the last version. Previous articleCyanogen Inc. Launches Themes Design Challenge!